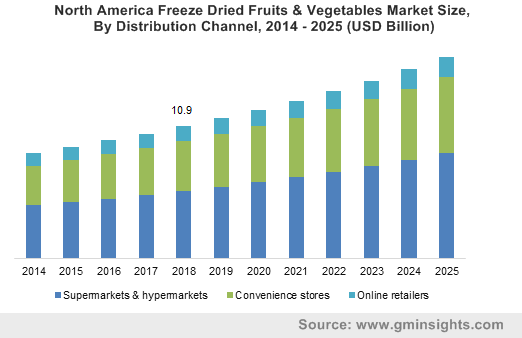 Freeze Dried Fruits & Vegetables Market size estimated at close to USD 40 billion in 2018 and will grow at a CAGR of around 7% from 2019 to 2025. Freeze drying is a relatively new technique to preserve food and increase their shelf life. The process involves freezing the food products, removing of moisture in a vacuum chamber, and then sealing it in an air tight container. Freeze dried fruits & vegetables market will be chiefly driven by positive developments in the global packaged food industry. Freeze dried fruits & vegetables are used in different packaged food formulations such as soups, juices, confectionaries, bakeries, and many more. A substantial amount of instant coffee commercially available across the globe is made from freeze dried coffee beans. Several companies are also involved in selling freeze dried meal boxes to end-customers. Thus, increasing demand for packaged food items across the globe, fueled by an increasing population and rising income levels of consumers will be a major growth enabler for the industry during the forecast period. The global packaged food industry is a trillion-dollar sector which is likely to grow at a steady rate of nearly 4% from 2019 to 2025. Changing lifestyle trends, increasing income levels, convenience of consumption, and rising health awareness are some of the key factors driving the global packaged food industry. The U.S. is a major packaged food market accounting for almost one-tenth of the global industry sales in 2017. Healthy eating, rising demand for ethnic and authentic Hispanic and Asian food, and concerns about lifestyle diseases are some of the major trends affecting the U.S packaged food industry. Thus, growth in the packaged food industry in the U.S. and across the globe will in turn drive freeze dried fruits & vegetables demand during the forecast timeframe. High cost of freeze dried fruits & vegetables are a major hindrance to the growth of the industry. Typically, cost of freeze drying is around five times higher than other conventionally used drying processes. The different equipment and dryers needed for the process also increases its cost by a substantial amount. The usage of these equipment also increases the energy cost of freeze drying fruits and vegetables. Based on products, the freeze dried fruits & vegetables market has been segmented into fruits, vegetables, and coffee beans. Fruits are a key product segment accounting for more than one-third of the overall industry size in 2018. Increasing usage of freeze dried fruit powders for making juices and other beverages will drive the segment’s growth. Vegetables product segment generated a revenue close to USD 10 billion in 2018 and is likely to grow with a CAGR of more than 5% till 2025. The market is segmented, based on form, into powders & granules, chunks/pieces, and flakes. Powders & granules segment is likely to gain the market with a CAGR exceeding 6% during the forecast timeframe. Powders are mostly used in making juices, soups, and other such beverage items. Flakes are used in a variety of packaged food items across the globe and the segment registered a revenue around USD 15 billion in 2018. Rising consumption of packages food products will drive the segment’s market development in coming years. 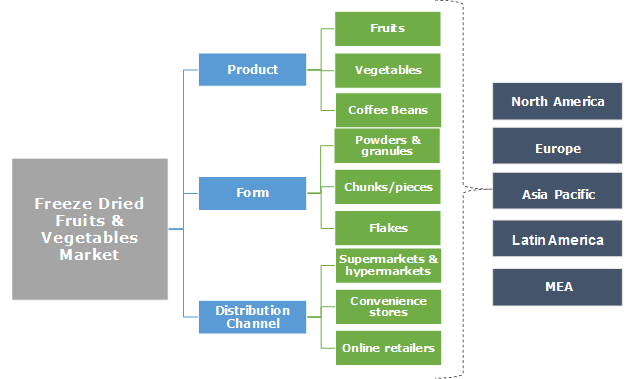 Based on distribution channel, the freeze dried fruits & vegetables market has been segmented into supermarkets & hypermarkets, convenience stores, and online retailers. Supermarkets and hypermarkets are a key distribution channel which is mostly preferred in developed regions such as North America and Western Europe. The segment registered a revenue exceeding USD 15 billion in 2018 and is likely to grow with a healthy CAGR in the forecast timeframe. North America is a major freeze dried fruits & vegetables market accounting for almost a fourth of the overall market size in 2018. Significant growth in the U.S. packaged food industry will be the major factor driving the North American market in the forecast timeframe. Europe is also a major regional market which generated a revenue of around USD 10 billion in 2018. Increasing demand for packaged food items in the major European economies coupled with rising income levels in the Eastern European countries will drive the regional market in coming years. The freeze dried fruits & vegetables market is characterized by the presence of a large number of manufacturers spread across the globe. Asia Pacific, mostly China, Japan, and South Korea has several medium and small-scale manufacturers catering to demand from local customers. Some of the key players in the market includes Nestle S.A., Mondelez International, The Kraft Heinz Company, The J M Smucker Company, OFD Foods, Olam International, Asahi Group, Ajinomoto Co., Mercer Foods, Van Drunen Farms, European Freeze Dry Ltd. and many more. Rising demand for the product and technological developments in drying equipment is likely result in many new players entering the market by the end of the forecast timeframe. Improvements in freezing technology has had a positive impact on the market development. The process not only helps in preserving different food items, but also decreases their volume and weight without having any negative impact on the nutritional content. This enables their usage in a broad range of packaged and ready-to-eat food products. Developments in the processing and packaging technology in the future will have a profound effect on the market growth.